A Disney Movie at Putnam Park! Putnam Park was recently used as a location for a scene in Old Dogs, a Disney film starring John Travolta and Robin Williams. Two weeks ago, the Disney crew was at the Redding Community Center filming another scene for the movie. Next week (Aug. 20th), the crew is expected to film scenes at the Redding Country Club. “There is no better spot for this particular scene,” he said. When the army broke camp, in accordance with custom, the barracks were burned, the chimneys fell in different directions which is still distinguishable in most cases, and then with time became apparently only heaps of stone. (Report 1903: 8) *Recent research indicates the barracks were not burned, wood was valuable back then. The movement to preserve and memorialize the site of the winter quarters of 1778-1779 in Redding began in the late 19th century. 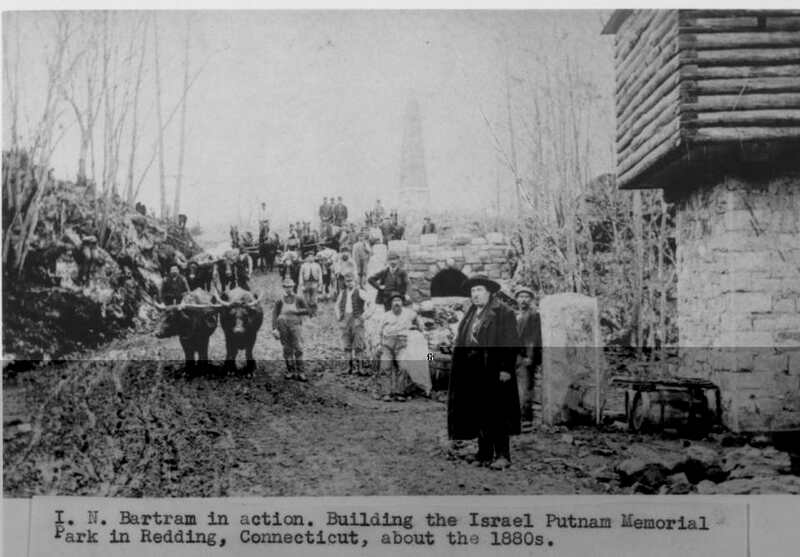 Although the details of this movement are not recorded, it is likely that the initial efforts were made by local citizens of Redding, especially Charles B. Todd, the local historian, and Aaron Treadwell, the landowner who donated the first tract of land that would become the Israel Putnam Memorial Camp Ground. The first official action leading to the creation of a state park on the site of the encampment at Redding was the passage by the Connecticut legislature, in January, 1887, of a resolution to establish a committee "to investigate and report at once on the practicability and desirability of obtaining for the State the old Israel Putnam Camp Grounds in the town of Redding, on which traces of said encampment still exist, and the erecting thereon of a suitable monument or memorial" (Todd 1913: 7). The legislative committee visited the site in February, 1887, which they described in a special report, dated February 9. The committee also reported that Aaron Treadwell, the owner of the site, was willing to donate the land to the state. The committee recommended that the state accept this offer and appropriate $1500 for the purpose of erecting a memorial on the site. The Connecticut legislature passed a resolution accepting these recommendations on May 4, 1887 (Todd 1913: 9). ...a certain piece of land situated in said town of Redding at the Old Camp" so called containing 12 acres more or less and bounded north by land of (Harsock?) Read East by heirs of Isaac H. Bartram South by Highway and West by Sherman Turnpike so called in part and in part by land of grantee... (RLR 24: 63). ...a certain piece of or parcel of land lying in said Redding at the Old Camp so called in quantity 12 acres bounded south by highway, east by heirs of lsaac Bartram North by Hannah Read West by Sherman Turnpike in part & in part by Aaron Treadwell (RLR 21: 154). ...quantity 18 acres more or less at Old Camp so called the same being pasture and woodland bounded North by heirs of Benjamin B. Read east by an old road formerly Sherman Turnpike south by highway leading from Lonetown Schoolhouse... (RLR 24: 298). From the beginning, the purpose of preserving the site of the encampment was to commemorate the winter quarters, not to create an area for recreation. In a plan presented to the legislative committee that visited the site, Charles B. Todd explained the rationale behind the park. It is not proposed to erect a pleasure park, but a memorial. The men it is designed to commemorate were strong, rugged, simple. Its leading features, therefore, should be of similar character and of such an historical and antiquarian cast as to direct the thought to the men and times it commemorates. The rugged natural features in which the proposed site abounds should be retained. (Todd 1913: 7). 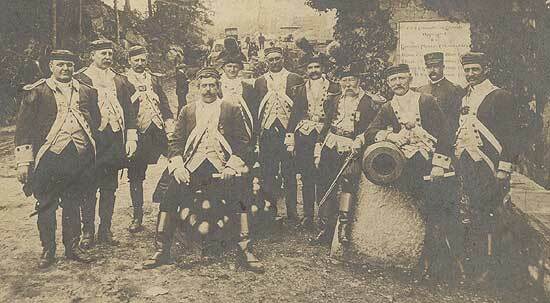 It was also recommended to erect a monument on the parcel to commemorate Putnam and his troops. In 1887, a sketch was made of the encampment site on the portion of the Treadwell property that would be donated to the state in the following year. This plan, entitled "Plan of Camp ground of Gen. Israel Putnams' [sic] Soldiers During Winter of 1778-1779 in Redding, Connecticut," is located in the Redding Land Records (vol. 25, p. 81), and is shown in Figure 11. As the earliest sketch map of the site, this plan is of considerable interest. In addition to showing the boundaries of the 12.40 acre Treadwell property, the plan identifies several features that were believed to be related to the 1778 & 79 encampment. These include an "old road built by Putnams [sic] soldiers;" a single hut and the "camp guard quarters," located in a "grove;" the main "line of soldiers huts," consisting of a double row of "remains of chimneys;" and a cluster of "officers' quarters" located near the monument. The granite obelisk monument was built in the summer of 1888 under the supervision of a committee appointed by the governor. This committee, during its work, had noticed that "the tract of twelve acres which had been presented by Mr. Treadwell very inadequately preserved the autonomy of the former camp. The line of barracks originally extended through the adjoining fields north nearly a quarter of a mile...." (Todd 1913: 9). This discovery led to the acquisition of additional land so that the entire winter camp might be included in the park. The Read property on the north of the Treadwell parcel (Plan 1) was purchased by O. B. Jennings and donated to the state on February 10, 1888 for "$1 and other good considerations (RLR 25: 90)." This parcel of almost 30 acres included the hill later crossed by Overlook Avenue, the so-called bake oven, and an additional area of firebacks; later Jennings gave another 52 acres of wooded land west of the camp grounds (RLR 27: 5). Twenty acres at the northern end of the camp, including the area around Philip's Cave, the "officers quarters, and the armies entrance into the camp, were purchased and donated by I. N. Bartram (Report 1903: 10). Two last donations completed the historical nucleus of the park. A gift of "7 acres 46 sq rods" was made on July 26, 1893 by Helen and Isaac Bartram (RLR 25: 301-3). This completed the circuit of Overlook Road. The property comprising the entrance to the park on either side of the Sherman Turnpike was given on July 23, 1889 by Aaron Treadwell (RLR 25: 150-52). All of these donated parcels can be picked out individually on the 1890 surveyed plan of the park, although how the Bartram donation of 1893 can be recorded on an 1890 plan is unexplained. The activities relating to the creation and maintenance of the Israel Putnam Memorial Camp Ground were managed by a board of commissioners appointed by the Connecticut General Assembly (Fig. 12). The commissioners reported on their activities beginning in 1889 and every two years thereafter between 1903 and 1915; these reports were published by the slate and are preserved. The report covering the 15-month period ending September 30, 1902 is particularly useful, because it contains a comprehensive summary of legislative actions, reports, expenditures, and lists of commissioners from the early years of the movement to create a state park (Report 1903). Other data relating to the management of the park include the record of minutes of meetings of the Putnam Memorial Camp Commission. These records are incompletely presented at the existing museum in the park. They include an original leatherbound book containing meeting minutes from July 11, 1901 to August 26, 1909; copies of minutes for the period July 14, 1911 through June 6, 1917; a folder containing original and carbon copies of minutes of the commissioners' meetings from July 7, 1921 through October 18, 1923; and carbon copies of minutes from 1947-49. In addition to the records pertaining to the commissioners' meetings and park activities, a series of maps and plans relating to the park was examined during the course of the survey. These documents were found in two places: the existing museum, on the park grounds, and in the files of the state Department of Environmental Protection in Hartford. Active work was begun at once in clearing under-brush and rock from the grounds, building drives, walks, log-barracks, and block-houses. We found the grounds rough and stubborn to clear. Much of the timber had been cut, leaving large and obstinate stumps to remove. We were forced to make many changes from the plans, as were they followed out, it would mar the beauty of many of the fine features of the camp, and come in contact with the fire-backs. These changes were made only after a careful consideration and by a vote of the Commission. (Report 1893: 51). These features--the antiquarian infrastructure of the park--were described in the parlance of the time as "improvements." The 1889 committee's report detailed some of the specific plans that were underway in the park (Bartram et al. 1889: 46-47): estimates were prepared for the construction of a main avenue (later called Putnam Avenue), side avenues, ways, and paths; for the construction of block houses and gates at the park's entrance; for the construction of a masonry dam; for bridges, culverts, stone and iron fencing, and gates; and for the building of "6 barracks with chimneys or log huts in ye olden time of 1778, at $200 each." One of the most important activities during the early years of the park was the clearing and landscaping of the terrain around the stone piles that marked the remains of the soldiers' huts during the encampment of 1778-79. While the park records make it clear that the preservation of the firebacks and other remains of the 1778-79 encampment was of paramount importance, it is also clear from a review of the records, supplemented by the evidence of archaeological testing, that the remains of the original camp suffered a great deal of disturbance from the methods that were employed by the early park to "restore" them. These included grading, landscaping, and removing trees, stumps, and stones, and it seems probable that most of the firebacks (in the main double row along Putnam Avenue, at least) were systematically cleaned out, their artifacts removed; some were certainly rebuilt, including several in the vicinity of the monument. The remains also suffered from the fact that in several areas (the guard house, log barrack, and stone barrack) modern reconstructions were built directly on top of the original ruins. Box of Bullets and Grape Shot found on the grounds, donated by Thomas Delaney. Wood with Bullets imbedded in it, found on the grounds, donated by Thomas Delaney. Putnam Avenue, the main avenue through the middle of the grounds. Overlook Avenue. runs over Overlook Hill on the west side of the park. Sustinet Avenue, passes up the west side of Prospect Hill. Terrace Road, runs parallel with Sherman Avenue separated from it by the retaining wall. Sheldon Avenue. connects the entrance. Putnam Avenue and Overlook Avenue on the south. Huntington Avenue, connects Sustinet Avenue, Putnam Avenue and Overlook Avenue on the north. The origin of the toponymy seems to be a mixture of historical associations and topographical descriptions. 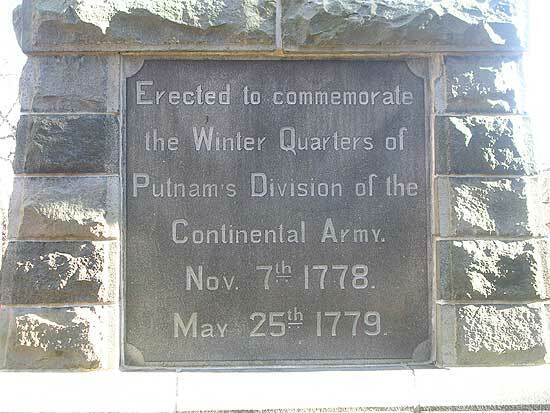 Putnam, Huntington, and Sheldon avenues were named for generals who were associated with the encampment: Major General Israel Putnam, who commanded the three brigades that wintered in Redding in 1778-79; Jedediah Huntington, commander of the 2nd Connecticut Brigade; and Elisha Sheldon, who commanded the state cavalry corps. 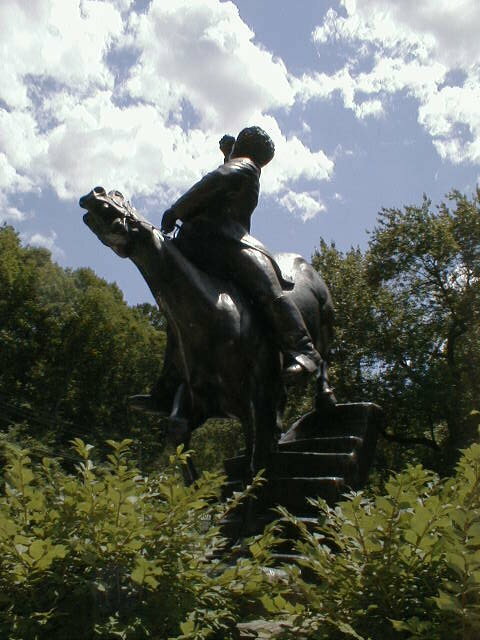 (Sheldon and his troops were mistakenly believed to have spent the winter in Redding; in fact, they were stationed at Durham, Connecticut). The origin of the name of Sustinet Avenue is obscure, although it may have derived from the Connecticut state motto, Qui transtulit sustinet ("He who has transplanted will sustain"). Overlook and Terrace avenues were obviously named for topographical features. Also built by the turn of the century were the main entrance to the encampment, with its substantial stone bridge, blockhouses, and gate posts; a "rustic bridge" and smaller blockhouses at the north entrance to the camp, on the Sherman Turnpike (Route 58); a pavilion (1893); horse sheds; a "work shop," moved to the park in 1896; and a "rustic arbor" (Report 1903: 11). The grounds are a part and parcel of the cantonment itself. It is a part of the landscape picture and without it the grounds will lack unity of design and purpose. It belongs to it and is needed by it as truly as the outside of the house is needed by the rooms inside. It will enable all the work shops, shed, and houses for domestic use to be off those grounds which an peculiarly sacred for association sake, and the swings, animals and birds which have been presented to the State and are of interest to the children to be moved away from amongst the relics of the camp. As the description indicates, the park commissioners envisioned a fundamental separation of the park into two areas: one, on the west side, preserving the historical remains of the encampment, and the other, on the east side, offering recreational and scenic resources. This functional division of the park has remained to the present. Despite the attempts of the commissioners to convince the state legislature to purchase the grounds of the "Old Put Club," it was not until 1923 that the state finally acquired the land on behalf of the park. Surveyed maps of the areas east of Route 58 were made in 1907 and 1923, and show various features and structures on the property (see Figs. 40, 41). The 1924 sketch plan shows the park with its modem outlines (Plan 3). In addition to the former "Old Put Club" grounds, additional new lands were acquired west of the original park grounds; a comparison of the park boundaries on the 1890 and 1924 plans shows how much new land was obtained for the park by the 1920s (see Plans 1, 3). The east side of the park includes Lake Putnam, formed ca. 1891 by damming the course of the Little River; several picnic grounds; the Park Manager's House, a 1925 Colonial Revival residence built on the site of the 1891 clubhouse of the Old Put Club, and apparently incorporating some of its structural elements; the park's maintenance garage, a Dutch Colonial fieldstone barn built in 1912; other former structures, including toilets, a shelter, and icehouse; and the site of an isolated group of possible firebacks. Meanwhile, on the west side of Route 58, several new structures were constructed in the 1920s. They included two buildings on Prospect Hill: the Colonial Revival museum, built in 1921, and the Park Ranger's House, a ca. 1925 Craftsman bungalow built on the south side of the hill to replace a former residence. Also by this time the so-failed "middle entrance" to the park, connecting the south end of Prospect Hill with the Sherman Turnpike (Route 58), had been built. In 1955 the state legislature voted to give control of the Israel Putnam Memorial Campground to the state's Park and Forest Commission. Today, the Putnam Memorial State Park is managed by the Department of Environmental Protection, Office of Parks and Recreation. For several years prior to the survey park activities had been limited to part-time maintenance carried out by a resident park manager and his assistant. By 1993 this was limited to occasional visits by a regional supervisor. From an short write up found in the Putnam Park Folder at the Mark Twain Library. *If anyone knows who the author is please drop me an e-mail. Adjoining the park proper on the east beyond the State road is its latest and most important addition -- a beautiful lake with dark wooded heights rising beyond -- the former holdings of the Old Put Club, which was formed the year after the park was opened, 1891, by several gentlemen of Danbury and Bethel -- Frank Judd, Samuel S. Ambler, George M. Cole, William Benedict, Theodore Ferry, Judge Hough and others, for the purpose of building a dam across Little River to impound its waters and create the beautiful lake we now behold. Its present bed was then a swamp of alders, willows, sedge and other aquatic plants through which flowed sluggishly the "' river, having just been formed by the three brooks that flow down the parkside from the west, and a larger one coming from the north along the Bethel road. 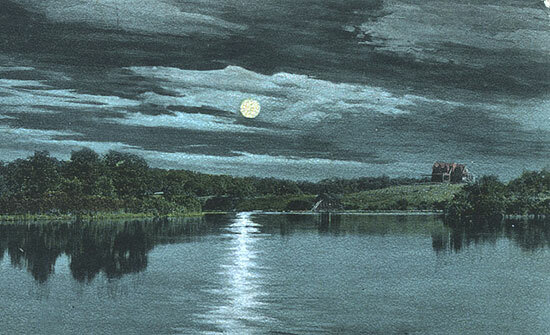 The site was chosen and the dam built by Isaac M. Bartram, and a clubhouse and keeper's dwelling was added soon after. For many years the Club flourished -- at one time, Mr. Frank Judd informs me, it had fifty members, but some died or moved away, others dropped out and at last it became necessary to sell and wind up its affairs; it was accordingly sold to the Rogers Peet Company of New York and for several seasons was used by them as a summer vacation resort for their clerks and other employees. The State acquired it in 1923. Its area is 103 acres -- greater than that on the west which is 102. We will now return to the Main Entrance and complete our tour of the grounds. Passing the Superintendent's modern cottage -- the former Clubhouse burned a few years ago and the State replaced it with this much finer structure. A short distance south, nearly opposite the store, we make a sharp turn east, go down below the dam and on rising turn sharp north where is a new road opened by the State since it acquired possession, running up over the wooded heights and regaining the State road near the North Entrance of the park. There are rocks and boulders on the hillside and a dense forest over all shutting out even a glimmer of the lake. The Commission hopes to open lanes and vistas through it this summer permitting its cheerful sparkling waters to greet the visitor. At the summit we will find eighteen stone heaps similar to those across the lake but not arranged in parallel rows more in squares circles and triangles -- an outpost of the main body no doubt set here to guard against attack from the east and south. Continuing on down the hill, still west, we come soon to a rough woods road leading left over a slight rise and down to the lakeside by the former summer camp of the Rogers Peet boys, now sometimes used for banquets and dancing parties. A few hundred yards farther on, crossing the brook as it enters the lake, we regain the State road near the Northern or Bethel Entrance to the park. By the 1970's and 80's park attendance was diminishing, buildings fell into disrepair and the park was officially decommissioned & closed when State Parks' operating budgets were pared back in the early 1990's. A small group of neighbors and local supporters volunteered to physically maintain the park the best they could from 1991 to 1997. 1997 was the year the park was reopened, due largely to the persistent efforts of the Friends and Neighbors of Putnam Park (FANs) who lobbied the DEP in Hartford for staffing and funding. On the heels of their success in reopening the park, the Friends and Neighbors of Putnam Park hired a restoration consultant to offer an opinion of whether or not the park's 1893 pavilion could be saved. The consultant said "Save the pavilion!". Next the DEP State Parks Division worked with architects to retrofit the Old 1893 Pavilion into a modern day visitor center. The old structure was dismantled piece by piece, beam by beam, and numbered. A new foundation was excavated for a new walk-out cellar level. Then the building was reconstructed using materials that were still sound. Today the new visitor center is a all climate-controlled building with rest rooms. The very expensive project included a new and safer Rt. 107/Rt. 58 intersection, new parking lot, and a new main entrance into the park. 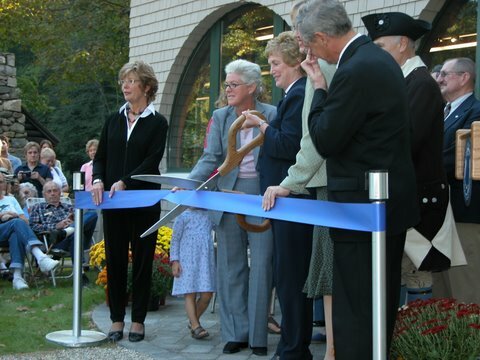 The visitor center grand opening was held on October 11, 2005. Putnam Memorial State Park in Redding has been designated as Connecticut's first State Archaeological Preserve. The designation, bestowed by the Connecticut Historical Commission, recognizes the archaeological importance of Putnam Memorial State Park and provides additional administrative measures for the park's protection and professional management. The "Friends and Neighbors of Putnam Memorial State Park" (FANs) initially requested the designation. It was later endorsed by DEP Commissioner Rocque and was officially designated a State Archaeological Preserve on January 3, 2001. Putnam Memorial State Park hosts many, many great learning programs throughout the year and is well worth the trip. 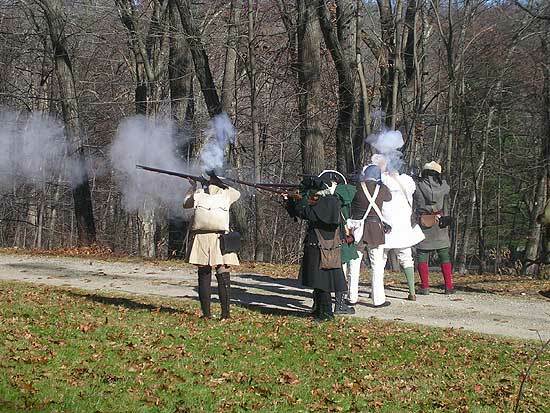 May is Living History School Days month; The annual Summer Craftsman Program runs 8 weeks in July and August; Living History Weekend complete with mock battle skirmishes is held in the Fall; the annual Winter Walk is always informative and held in December. Museum: The building contains exhibits and historical material related to Redding's encampments. Open 11am to 5pm daily, Memorial Day thru Columbus Day. Park is Open: Daily- 8am to sunset.